The best thing about waking up isn't the coffee in your cup. On Thursdays, it is running to the end of the driveway for your Los Angeles Times Food Section!! And while I enjoy reading it online the night before, I'm old school and love reading the newsprint while eating breakfast on Thursday. If you are like me and a devoted reader for years...then this Saturday will be awesome! 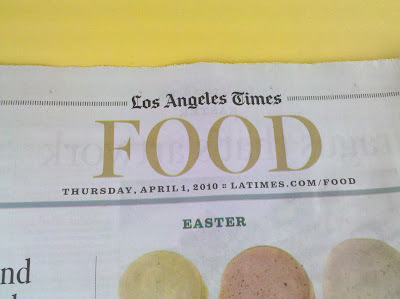 I remember when the LA Times Food section published their first color photo! The Culinary Historians of Southern California are presenting a great panel of speakers from the heyday of the LA Times Food section this Saturday. Come out to LAPL's Central Library (with a massive food and cookbook collection) to enjoy this talk! With over 100 work years of combined experience, the team of Betsy Balsley, Donna Deane, Rose Dosti and Barbara Hansen produced the Los Angeles Times Food section in its heyday beginning in the late sixties, into the 1980's. During this era the food section had 40 to 50 pages every week, with popular columns such as Culinary SOS and Borderlines and dozens of original recipes. Recipes were prepared for publication in a magnificent test kitchen. The LA Times Food Gals will reminisce about this extraordinary era of food journalism, the resources they had to produce a great food section. That is so cool! I remember eagerly awaiting the LAT food section every week as a child (maybe I should have taken that as a sign that I liked cooking). You have a real treasure in LA. I wish I could be there for this event. I lived in Los Angeles from 1975 to 1995 and loved the Times food section, such a great group of food writers. Love the L.A. Times, and so miss the SOS column...I use to love to sit in the morning and pour over the food section.......those were the good old days, and the great recipes....I still have bags of them that I cut out!!!! I get them out every once in awhile, and pour through them, and pick out a couple gems to try!!!!! !